Is this sub worth $50,000? My son and I will be competing in the National Beef Cook-off on Thursday, September 13. We're in the "Kids in the Kitchen" category, which required us to use eight ingredients or less, and have a total preparation time of 30 minutes or less. 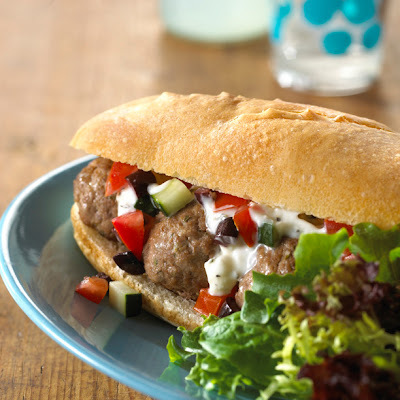 Our recipe is Greek Meatball Subs. That's the official photo from the beef people -- I hope ours turns out looking that nice. There are four categories of five recipes each. Each category has a runner-up ($5,000) and a winner ($10,000). In addition, there's a "Best of Beef" winner that wins $50,000. If you want to look at the other finalist recipes, they are here. (By the way, it says something about voting, but the voting appears to be over.) Anyway, I'd be surprised if the "Best of Beef" winner came from our category, because other categories got to use more ingredients and take more time. The cook-off is open to the public. For friends & family who want to come watch us, you'll have to get up early! We'll be cooking at 7:40 a.m. at the Renaissance Hotel in Chicago. With the boys starting school this week, it's going to be very busy between now and then. Look for a post sometime after September 15, and I'll report back on our experience!